Why Natural Muscle Ascot Vale? 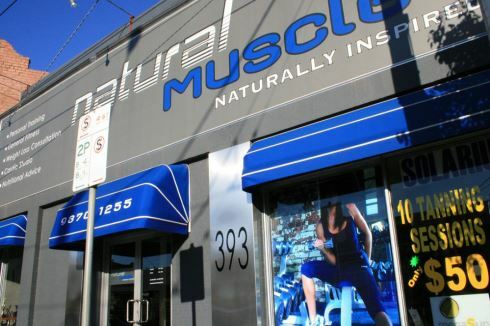 Natural Muscle is Melbourne’s own finest and best-equipped Boutique Personal Training/Gymnasium centre around. Located in the inner western suburb Ascot Vale on the out skirt to the CBD. Our founders Dom, Nick and Charlie are all champion athletes in there own ways from Bodybuilding to Marital Arts in which they all offer a wealth of experience to help you reach the goals you desirer. So come on in to our Ascot Vale gym and let one of our friendly staff members help you get started and get that body your looking for. We at Natural Muscle Ascot Vale gym value you as a member and go out of our way to offer you a service that you can’t get anywhere else. Natural Muscle is set to permanently change the way you experience gyms and the fitness industry with its boutique studio and 5 star fitness service. You will experience many luxury services not found in many gyms. With a fully equipped state of the art training facility, we also spoil our members with change room facilities which are in line with some of the top hotel chains. Natural Muscle provides for its members a fully equipped kitchen that includes, among other things, a professional coffee making machine of restaurant quality with free breakfast every morning. We also provide free protien shakes and huge discounts in our inhouse supplement shop. At Natural Muscle you will be Naturally Inspired, every time you come to train. Personalised training with Dom and Nick. Huge range of dumbbells for all levels. Outdoor training in our outdoor courtyard. Top of the range fitness equipment. Our owners are always available to help you reach your goals. Our cafe and kitchen facilities with free breakfast. Natural Muscle Ascot Vale gym provides an exclusive VIP Memberships experience for our valued clients. Our renowned Ascot Value personal training packages with our championship athletes provides an investment into your health and well-being for years to come.